The Premier’s Active April (PAA) campaign is part of the Victorian Government’s commitment to promote healthy, active lifestyles and have Victorians physically active. The campaign runs for the entire month of April. It offers prizes to Victorian schools, workplaces and individuals for being more active. The Victorian government knows that, as dancers, we are already physically active. However, they need us to help inspire our fellow Victorians to dance and increase their physical activity. 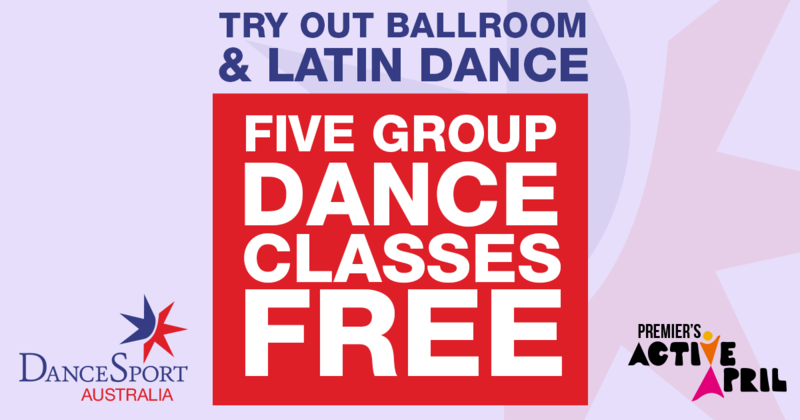 What better way to ‘try out’ dance than by attending five free Ballroom and Latin dance classes from one of our participating dance schools or studios! Mentioning the names of your friends on Facebook to give dancing a go! The five free Ballroom, New Vogue and Latin group classes will enable a shared experience and the potential to make new friends. The website is comprehensive and has been designed to make it easy for people to find their nearest dance school or studio. All the participating dance schools and studios are Registered Training Facilities (RTFs) with DanceSport Australia. This means they are recognised by our sport's governing body and abide by a Professional Code of Conduct. Geoff Vine, Chairman of DanceSport Australia’s Marketing and Communication Commission, stated, "Support for the program from Victoria has been amazing. It clearly demonstrates the goodwill within the industry and how it can pull together to provide a unique and compelling offer for the benefit of Victorians. After all, five free dance classes is a very generous offer." How great is that? Even more reason to promote PAA! DanceSport is a Major Partner for PAA! The generous offer and industry support put together by DanceSport Victoria has given us Major Partner status in the Premier’s Active April campaign. Check us out on the Major Supporters page on the PAA site. Geoff Vine said, "We are confident this year will be an even greater success than last year. By working together we can bring great benefits to people, dance schools and DanceSport. In fact, we are now working on expanding the program to offer five free dance classes across Australia! It's an exciting time for DanceSport."